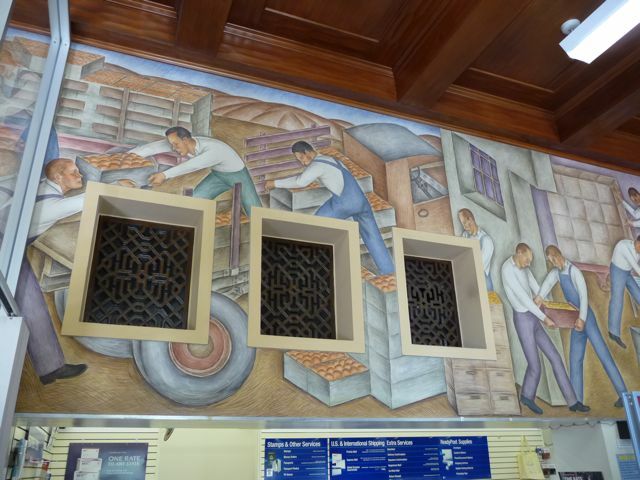 The Gordon Grant murals, located in the Ventura Post Office, are a series of beautifully restored scenes depicting life in pre-World War II Southern California. Last Fall I was at a work-related conference in Ventura, California, a wonderful city located approximately sixty miles up the coast from Los Angeles. I stopped by the post office to drop off some letters - that's where I discovered the murals. 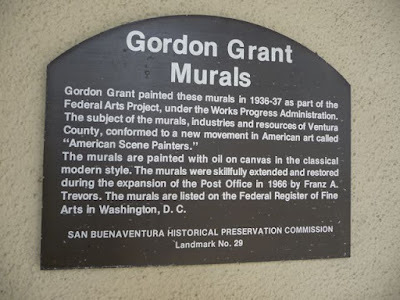 The sign outside was helpful in terms of information: Depression-era artist Gordon Grant painted these murals between 1936-37 as part of the Works Project Administration. They were restored and expanded thirty years later in 1966. 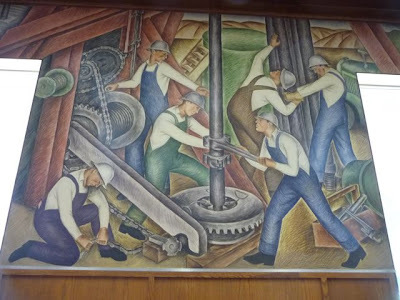 The Works Project Administration was a federal project in the 1930's designed to put unemployed Americans to work on various public works projects, including building bridges, dams, roads, etc. 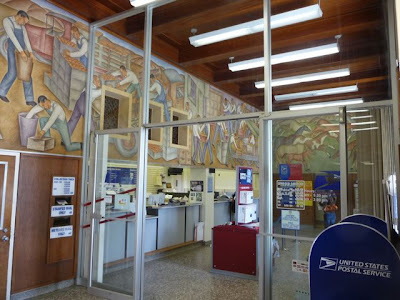 It's impressive how these murals wrap around the building's architecture, including the square ventilation openings, when the building was expanded in the 1960's. I love the style, known as American Scene Painting, or Regionalist painting. According to a wikipedia article, "Much of American scene painting conveys a sense of nationalism and romanticism in depictions of everyday American life. 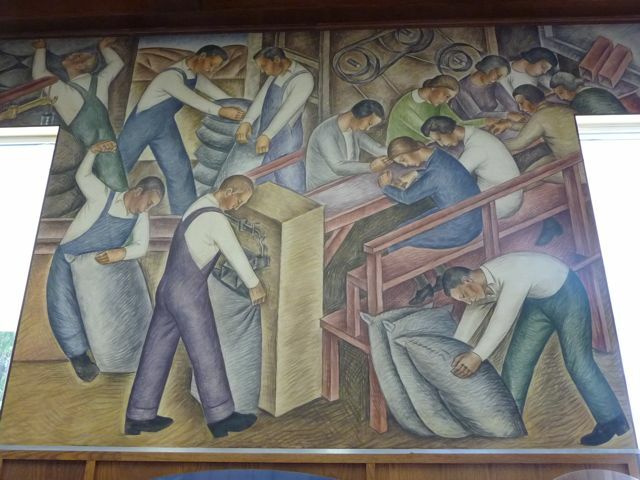 During the 1930s, these artists documented and depicted American cities, small towns, and rural landscapes." I also appreciated the subject matter: work. With an unemployment rate of 25% during the Depression, I wonder how many men and women were still looking for work when these murals were painted. 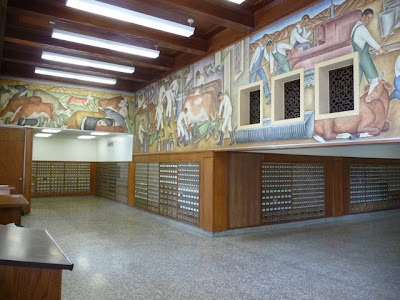 75 years later, I'm glad artist Gordon Grant was able to find work in terms of these murals. When I was in High School, still very new to Christianity and to faith, a friend my own age was talking about his job at a local gas station (remember when High School kids actually worked at places like gas stations?) and said "hard work is a good thing." Wow, really? Thirty years later, I realize that he was really right but as a typical (read: lazy) teenager, hearing a comment like that from someone my own age came as a shock: "Hard work a good thing? Is he nuts?" I grew up with a mindset that work, especially hard work, was something to be avoided, certainly not something I would have considered "good." Journalist and University of Texas, Austin professor Marvin Olasky has written extensively about work, specifically from a Christian world-view. 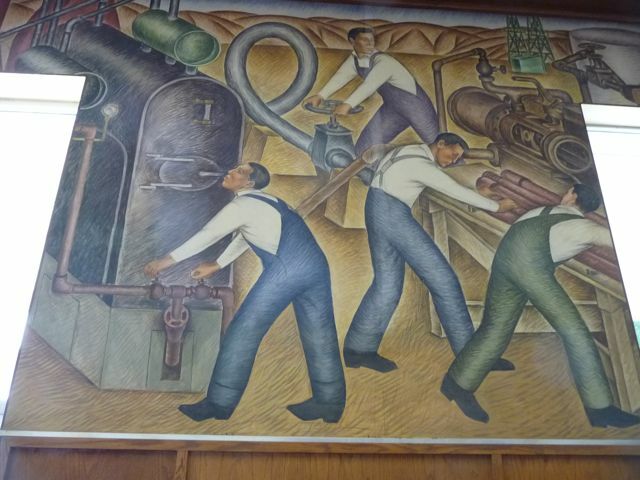 I came across a fascinating interview between Olasky and Darrow Miller on attitudes of work and how this can effect entire societies. 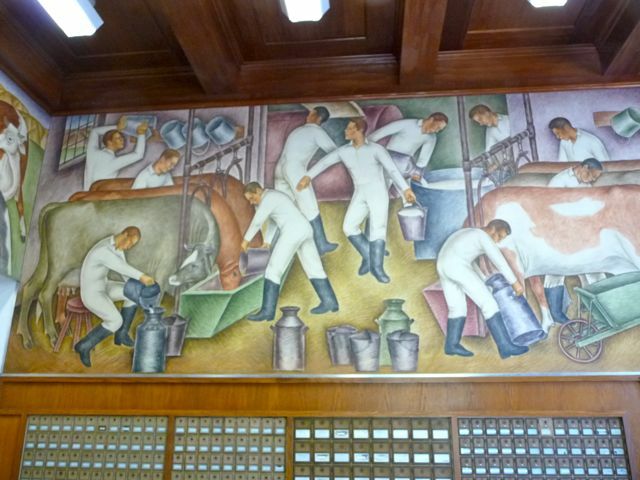 Is work something to be avoided, or embraced? 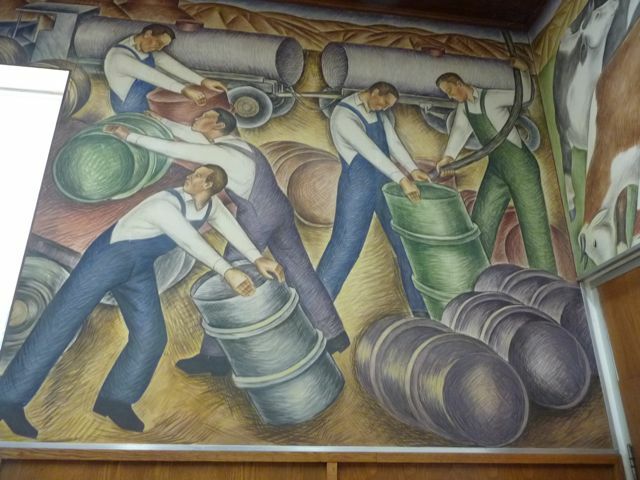 What happens to a society when work is seen as a "curse"? I found the interview with Miller, a Los Angeles native and a 27 year veteran of the non-profit organization "Food for the Hungry," really worth reading. You'd have to be a real fan of Depression era public art to make a trek to Ventura just to see these murals. 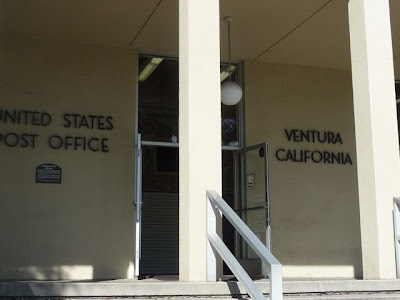 On the other hand, if you're in Ventura, or heading up the coast (a la the 1970's band America's song "Ventura Highway") it's only a couple of minutes off Highway 101. 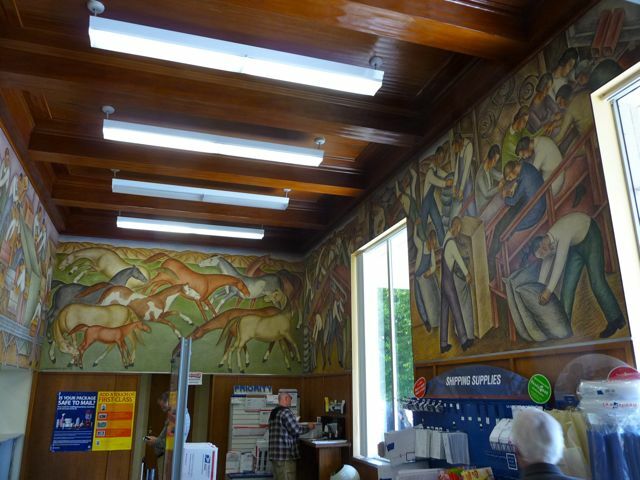 Stop by and have a look. Located at 675 East Santa Clara Street, Ventura.